WEEKEND DINGHY is featured in my new book GOOD SKIFFS. She is a stitch-and-glue skiff with all of her parts precision cut on a computer-controlled router table. She is quick to assemble and glue together; 15 Weekend Dinghies were built in two days at the 1999 WoodenBoat Show! A sailing rig is available. WEEKEND DINGHY kits are now available. The kits includes all the plywood pieces including bottom, side panels with precision stepped scarfs, seats, frame, knees, skeg,and breasthook. The kit is cut from 6mm and 9mm BS1088 Okoume plywood. Estimated cost for quality construction materials (not including sails) is $600. This cost includes a high level of outfit and finish you can be proud of after putting the effort into building this fine boat. Purchase and Download Study Plans for the WEEKEND DINGHY for $5.00 in PDF format (zipped file). 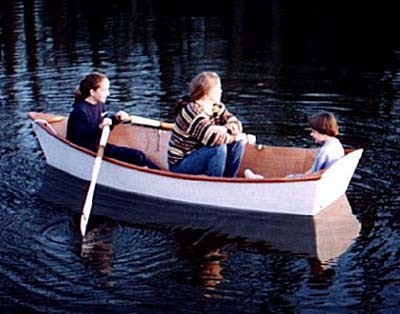 Purchase Construction Plans for the WEEKEND DINGHY for $55.00 for delivery by US Postal Service.